Mohabat News: The initial trial of an Assembly of God (AOG) church pastor and three ministers of the church was held, while other Christian believers in other cities of Iran await their trial. 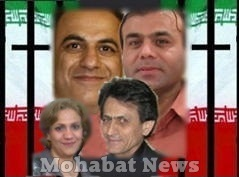 According to « Mohabat News » reporters, court session for four Christian converts was held in Ahwaz. The official trial of four Christian converts was held on October 15, 2012 at Branch 2 of the Revolutionary Court in Ahwaz. The court was chaired by the judge Seyyed Mohammad Bagher Mousavi. The four Christians who had been arrested on December 23, 2011 are: the pastor of the AOG church of Ahwaz, Farhad Sabokrouh and his wife, Shahnaz Jeizan together with two other church ministers, Naser Zamen Dezfuli and Davoud Alijani (Also known as David). The reports received at Mohabat News indicate that in the first day of the trial, referring to the article 500 of the Islamic penal codes the judge announced these four Christian converts guilty and sentenced each of them to one year in prison, totally four years for all. The Revolutionary Court announced their charges as "Converting to Christianity, inviting Muslims to convert, as well as propagating against the Islamic regime through promoting Evangelical Christianity". The article 500 of the Islamic penal code mentions, "Anyone who propagates against the Islamic Republic or in interest of groups and organizations opposing the Islamic regime in any ways may be sentenced to three months to one year in prison." Also, the two-page petition issued by the court says that the belongings of these Christians that are referred to as "the means of committing crime" may be confiscated. It is worthy to mention that as part of searching these Christians' homes, security authorities confiscated their personal belongings including their computers, books, cellphones, DVDs as well as sound equipment and music instruments used at the church. The prison term for these Christians has been issued by an initial court. This gives these Christians a chance to appeal. If they do, an appeal court will be held and final verdict will be issued by that court. The trial of pastor of the AOG church in Ahwaz as well as other members of this church was held while trial of five other Christian converts had been held in Shiraz some days ago. According to received reports, Pastor Farhad Sabokrouh is denied the right to hold any kind of church service or visit Christians in Ahwaz since his temporary release on bail. Also, authorities have told him to leave his hometown, Ahwaz. The pastor and his family are somehow exiled to Tehran. As an official pastor, he has no right to get involved in any kind of church activities or serve other Christians. In a pre-organized attack, security authorities raided the AOG church of Ahwaz on December 23, 2011 as church members had gathered for church service. All of the church attendees were arrested and transferred to a disclosed location by two buses. Security authorities had covered their faces when they raided the church and even arrested terrified Sunday school children. This arrest caused serious mental harm to the kids. All those arrested were released hours after their arrest after their personal information was recorded and were interrogated and threatened. However, the pastor, his wife and two of the church ministers were transferred to a detention center for further interrogation. Mrs. Shahnaz Jeyzan, wife of Pastor Sabokrouh and a minister of the church was also temporarily released on bail on January 1, 2012 after spending days in detention. While security authorities had asked leaders of the AOG church in Iran not to take any action for release of pastor Sabokrouh, the pastor as well as two other church ministers were temporarily released on February 21, 2012 after two months in prison. They submitted a title deed as their 200 million Toman (Approximately 165,000 USD) bail for their release. The official house church of Ahwaz which is known as the AOG church of Ahwaz is completely under Iranian authorities' watch and security authorities are fully and clearly aware of activities of this church. Requesting anonymity, some sources told Mohabat News, "The reason behind this attack that interrupted Christmas celebration could be because church officials ignored warnings of the Ministry of Intelligence to the church." According to published reports on situation of churches in Iran, it is said that "the organization dealing with cases of Christians and official churches in Iran is not the Ministry of Intelligence anymore and this task is given to the Revolutionary Guard's intelligence service. Also, the Ministry of Intelligence tightly watches over official churches and their congregations, summon their leaders and give them monthly instructions they are obliged to follow. However, there have been instances where Persian speaking service and service in which Persian speaking members mostly attend, were closed following the order of intelligence authorities of the Revolutionary Guard. The article 13 of the Iranian constitution clearly states, ""Christianity, Judaism and Zoroastrianism are the only recognized non-Islamic religions and their followers are free to practice their faith and perform their ceremonies within the limits of the law and act according to their own canon in matters of personal affairs and religious education." It should be mentioned that harassment and discrimination against religious minorities has been a major Human Rights violation issue by the Islamic regime of Iran, during the last 30 years. For a Muslim wishing to leave Islam "there is no compulsion of religion" simply is not true. Regime change by Iranians for Iranians is the only way to end 34 years of uninterrupted gross violation of human rights by the Messianic Islamist Rapists, “Reformers” and all.